Ma'antah is an exceptional girl who has many abilities, such as cooking and talking to animals. The villagers call her Sense Pass King because she has more sense than the king. The king is frustrated by her and tries to kill her but she outsmarts him. Later, she works in the palace and is able to make the country better. 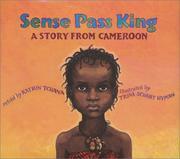 Tchana, Katrin, “Sense pass king: A story from cameroon,” Children's Picture Book Database at Miami University, accessed April 19, 2019, https://dlp.lib.miamioh.edu/picturebook/items/show/13865.